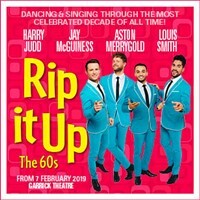 This show celebrates everything there is to love about the 60's,oneof the most energetic shows to hit the West End stage it will leave you feeling exhausted just watching! The ultimate strictly boy band of dance bring the 60's smashing into the century in an explosion of song, dance and acrobatics. One of the most energetic shows to hit the West End stage, just watching will leave you exhausted.